And baby, Chita's GOT IT! Tonight I was treated by my friend Ashley to another dose of Chita Rivera's The Dancer's Life. 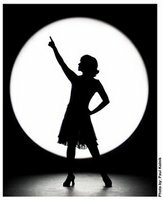 She added "America" from Westside Story to the lineup of recreated numbers and it was fabulous! She is so genuine and so humble and has such a beautiful stage presence. Chita is a force - I think I smiled for the entire two hours. Another reason to GRIN: Angela Lansbury was in the audience! I was talking to my friend Ashley* before curtain and I just happened to look down the row to the center section. There was Angie herself! I nearly fell out of my chair. I know my gasp was audible throughout the house - it was as if time stopped. I started hitting Ashley on the arm and saying "llloook lllook lllook over there" - she gave me a what the hell look and I finally sputtered out "it's Angela Lansbury over there". I called Noah** during intermission and he demanded that I go speak to her so I marched over! As I walked toward her, "me heart was a'flutter". I'm certain that my heart rate has never been so high. I told her my name and about the letter she sent me to which she immediately responded, "it's so lovely to meet you in person", then gave me a hug! Gasp! I just told her it meant a lot to me that she sent me a letter and that she is so beautiful. She looked tremendous - tall, straight and so beautiful in person. I also told her that I just saw Nanny McPhee last night and she said "Oh, isn't it the cutest?". I nearly hyperventilated and Ashley wanted to get me a paper bag to breathe into. Of course, I don't have a picture with her to share but my friend Ashley did see me across the theatre talking to her. Anyway, a picture may be worth a 1000 words, but this memory is worth a million bucks! * If Ashley had not decided to go and invited me to go with her, I would not have had this sensational experience. Thank you Ashley! **Professor Noah regulary conducts master classes in the art of talking to the theatre gods. FYI - Not a good idea assaulting a soon to be lawyer! Fabulous -- good for you! What a classy lady she is. I don't know, though -- Lansbury and Sondheim in the same week? You might never recover. 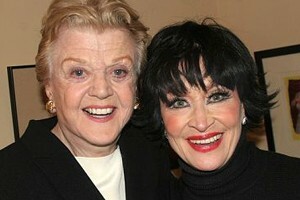 omg i can't believe you met angela lansbury--kudos for going up to her. it sounds like she was just delightful. what a great story!